A prehistoric giant ancestor to the crocodile has been discovered. The crocodile-like creature called "Shieldcroc" because of a bony shield shaped plate on its head is believed to be 30 feet long. It's head is already 5 feet long. Shieldcroc lived during the Late Cretaceous approximately 93 to 99 million years ago. 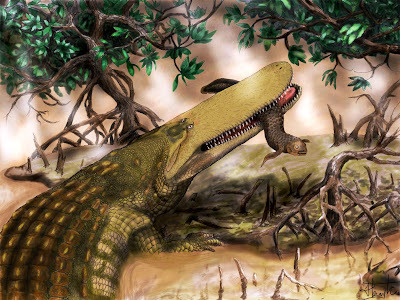 Its skull was discovered in continental freshwater deposits from what is now Morocco, and researchers think that modern crocs may have first evolved near the Mediterranean Sea. The crocodile is capturing greater interest due to its hard-to-miss "shield," a raised mound of tissue packed with blood vessels and likely covered by a thick sheath, similar to a triceratops. It might have helped to regulate body temperature, but probably served a cosmetic use. Its discovery provides scientists with additional information about the evolution of crocodiles and how scientists can gain insight into ways to protect the species' environment and help prevent extinction. The discovery was published this week in the journal PLoS-ONE (Public Library of Science). "Aegisuchus witmeri or 'Shieldcroc' is the earliest ancestor of our modern crocodiles to be found in Africa," said Casey Holliday, co-researcher and assistant professor of anatomy in the MU School of Medicine. "Along with other discoveries, we are finding that crocodile ancestors are far more diverse than scientists previously realized." Shieldcroc is the newest discovery of crocodile species dating to the Late Cretaceous period, approximately 95 million years ago. This period is part of the Mesozoic Era, which has been referred to as the "Age of the Dinosaurs;" however, numerous recent discoveries have led to some scientists calling the era the "Age of the Crocs," Holliday said. 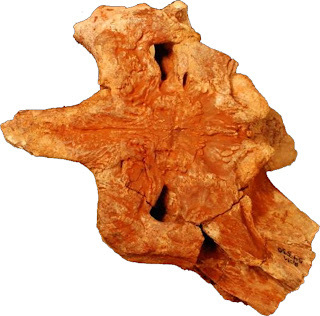 Holliday identified Shieldcroc by studying a fossilized partial skull specimen, which was discovered in Morocco and held by the Royal Ontario Museum of Toronto for several years before Holliday analyzed it. By analyzing blood vessel scarring on the bone, Holliday determined that the crocodile would have had a structure on top of its head, resembling a shield. The dents and bumps on the bone indicate veins delivered blood to a circular mound of skin, something never before seen in a crocodile. He said the shield was likely used as a display structure to attract mates and intimidate enemies and possibly as a thermo-regulator to control the temperature of the animal's head. Holliday compared Shieldcroc's skull to those of other crocodilians. By comparing slopes of various bones, he found that the new species had a flatter skull than other known species. With this information, he believes it is unlikely that Shieldcroc wrestled dinosaurs on or near the shoreline. Instead, Holliday said the fossil indicates that Shieldcroc had thin jaws, likely used to catch fish. "We believe Shieldcroc may have used its long face as a fish trap," said co-author Nick Gardner, an undergraduate researcher at Marshall University. "It is possible that it lay in wait until an unsuspecting fish swam in front of it. Then, if it was close enough, Shieldcroc simply opened its mouth and ate the fish without a struggle, eliminating the need for strong jaws." In addition, Holliday analyzed Shieldcroc's skull and brain to estimate the overall size of the reptile. He said scientists often use head size of an animal to estimate its total length. Using several parameters, Holliday and Gardner estimate that this specimen had a 5-foot long head and was 30 feet long. "Scientists often estimate body size of crocodilians based on the size of the skull," Gardner said. "However, estimating the body size of Shieldcroc was difficult, due to the enormous size of the skull compared to other crocodilians. To make a size estimate, we compared several features of the bone to many different species." Although Shieldcroc lived more than 90 million years ago, Holliday said scientists can use information about the animal to gain a better understanding of today's crocodiles. He said this insight grows in importance as humans encroach on ecosystems. "Today's crocodiles live in deltas and estuaries, the environments put under the most stress from human activity," Holliday said. "By understanding how these animals' ancestors became extinct, we can gain insight into how to protect and preserve the ecosystems vital to modern crocodiles."